Wise investors buy rentals hoping the houses will later appeal to first-time home buyers upon resale. Many of these homes are priced at the lower end of the market and situated in nice neighborhoods. To maximize profit when selling, most landlords plan to sell their rental homes to first-time home buyers and not to another landlord, because first-time home buyers may pay higher prices. However, if you're buying a home that was previously rented, you should exercise caution. A home that was occupied by tenants could be an excellent deal or it could be a deferred maintenance nightmare. First, make sure the other homes on the street are not rentals. Talk to neighbors and find out. If all the other homes are owner-occupied residences, this will offer a bit of protection against possible market value fluctuations. If that rental house is the worst house on the street, you might be able to negotiate the deal of a lifetime. Is the lawn overgrown and the grass dying? Does it scream out for curb appeal? Those are simple flaws that you can fix yourself but may have a huge impact on the price you will pay. It's best if the home is vacant, but some landlords leave the tenants in the property while it is on the market. Be prepared to give the tenants 24-hours' notice before previewing the home, as many require advance appointments and won't allow a lockbox on the home. Tenants might try to sabotage the sale by exaggerating minor issues or making up problems with the home so they won't be forced to move out. Tenants don't always keep the home in immaculate showing condition, so try to overlook their stuff. Tenants may discourage you from opening closets or looking in cabinets, which you can do if they are absent. Look for obvious signs of damage to the home like holes in the walls, ripped or dirty carpeting, and leaky faucets or unrepairable appliances. Tenants don't always pay their rent on time but mortgage payments are due regardless. Many small-time landlords can't afford to pay the mortgage if they don't receive the rent. 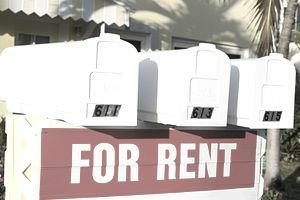 Landlords sometimes get burned out by owning rental property, and tire of the late-night phone calls and tenant demands. If the seller has rented out the house for many years, the seller might have no depreciation left for a tax deduction and be eager to do a 1031 exchange into another property. A landlord with a tenant-occupied home who decides to sell during a falling market is ready to take the hit on the sales price. The home could require repairs that the seller cannot afford to make. Always get a home inspection before buying any house, but especially before buying a home that was rented. Owner-occupied homes tend to receive better maintenance because the owners are on the premises and can take care of small problems before they develop into major issues. Ask your real estate agent for a list of referrals to home inspectors and interview them before committing. Ask to see a sample home inspection report. Bad home inspectors might generate 3 or 4-page reports. Your home inspection report should consist of 30 or more pages. Ask the home inspectors about their former occupations and hire those who were employed in a similar field. Be present for the home inspection, which should last from two to four hours. Ask questions. If you find a major defect, ask the seller to fix it or credit you money toward your closing costs through a request for repair. Don't submit a laundry list of piddly requests. Narrow it and focus on the really expensive repairs. Should You Wait to Buy a Home in a Down Market?